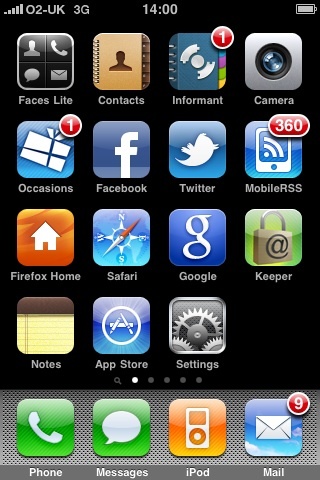 I finally decided to update my iPhone to iOS4 this weekend. 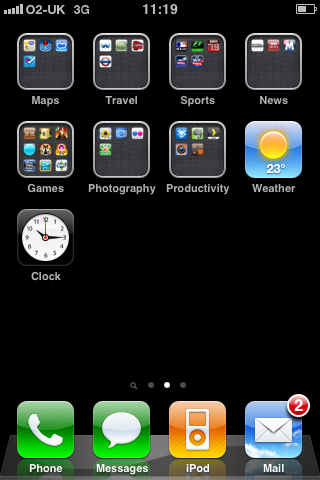 Several of my apps seem to no longer support iOS3 so I had no choice but to bite the bullet. The upgrade process took HOURS. I left it going over-night in the end... it would insist on backing up the phone which is what took all the time. So now I have the shiny new upgraded system... no multitasking for 3G phones but there are other good things. The look has been given an upgrade with the permanent dock now looking more like the images I have seen of the Apple computer desktops. There is also now a fantastic option to group like items together - which saves screen space. There is also an annoying inclination to archive email messages instead of deleting them. This can be switched off under the email account preferences in Settings. I think this is actually version 4.01 so maybe it was a good thing I gave it a few weeks for the bugs to be ironed out as I've not had any problems so far (touch wood).